How to set up and run an evangelistic Internet cafe as an outreach program in an unreached people group. Also how to successfully run the Internet cafe as a self-supporting small business. Internet cafes are great ministry platforms as they allow you to meet people again and again as they come into check their email and they can provide a source of financial support for the church-planting team. They are relatively cost-efficient at about $5000 each to set up and a well-run icafe can support 2-3 indigenous missionaries. There is an incredible demand for technology in the developing world and properly run Internet cafes are consistently successful as small businesses. A good size is around 20 client machines. Below ten client computers there is not sufficient revenue to meet fixed costs, above 30 computers some may remain idle a good part of the time unless you have an excellent location. A good location is on the second floor of an office or shopping complex near a school or business district. In some areas ground floor locations can face a substantial risk of theft. To setup LTSP (Linux thin-client software) on a Raspberry Pi you might want to use BerryTerminal which is esepcially designed for that purpose. 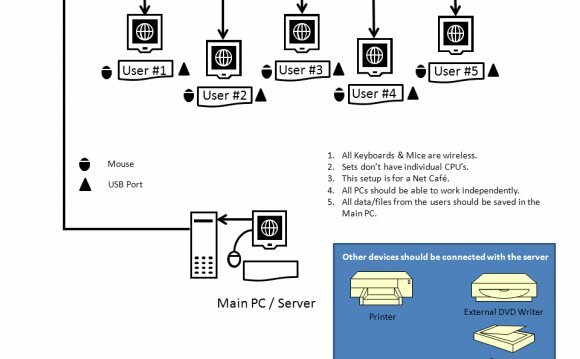 Once setup the thin client will run applications from the server (which can even be Microsoft applications such as MS Office). In an Internet cafe you can use older computers but you should use nice flat screen monitors. Customers do not care much about the "box" but they do care about speed and the user interface. Older computers can be made to work at high speed by using 'thin-client' technology which is explained in the training manual. One machine is a powerful server running Windows 2003 Server, this is then 'served out' to the client machines (older computers) using Linux Thin Server Protocol. This is a bit technical but the result is that the older client machines run at the same high speed as the main server.